Naked cakes. Silhouettes. Metallic. 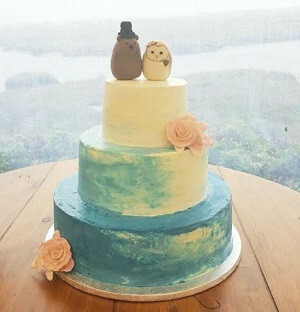 According to Kelly Field, the Casual Gourmet's Senior Cake Design Specialist, these latest wedding cake trends are all linked by how non-traditional they are, and all of them can be found on Cape Cod. "Because it's a destination wedding for most people, they bring in ideas from all over, not just sticking to nautical," she says. Field and her team have worked on a lot of detailed cakes, from incorporating elaborate gold paisley designs to painting illustrated flowers. They also mold chocolate seashells, cut out silhouettes, and arrange the greenery. She says, "We have a very large range, but I'd say simple is sometimes better. Some of these simpler cakes with flowers are really beautiful." It really depends on the wedding, though; she says that metallic paisley patterns are popular at Indian weddings, while the simpler naked cakes are great for a casual, summer feel. Personalizing cakes and bucking tradition seems to be the most popular trend, from the icing to the cake topper. In fact, Fields says traditional toppers have become scarce in favor of flowers, owls, woodland creatures, and even action figures. "Anything goes these days. These clients are personalizing the cake toppers instead of staying with just traditional." But while a gorgeous cake is great for photos, but what guests will really remember is how it tastes. "One of the things we do is we spend a lot of time formulating our cakes to taste good." That's why the Casual Gourmet prefers using buttercream frosting over fondant. "We can get our buttercream super smooth like a fondant," she says. "We spend a lot of time coming up with new ideas to improve our designs. To us, buttercream not only tastes better but has a better presentation." Then there are the flavors...from a light lemon cake with raspberry mousse, funfetti with strawberry cream, to a decadent chocolate cake with sea salt caramel filling. How do you choose when they all sound delicious? Fields says that having a different flavor for each tier is very much in vogue, letting the guests choose for themselves. She says, "It's more like a dessert station than a standard serve." One of the biggest non-traditional cake trends you can find on Cape Cod is to not have a cake. "We do all kinds of alternative desserts. People have started to move away from the traditional cakes," she explains. Instead, guests might be treated to cannoli stations, petite desserts, and of course, cupcakes. Surprisingly, one tradition has continued; couples saving the top layer. "We provide the top layer to keep and people will eat it on their anniversary," says Fields. However, it doesn't always last that long, and she says they often get couples coming back for another a week later, as they've already eaten it. But despite all the unique and non-traditional cake trends there's still a place in Cape Cod for the classic nautical theme. â€œI would say that nautical is always standard, but it comes in phases," she says. 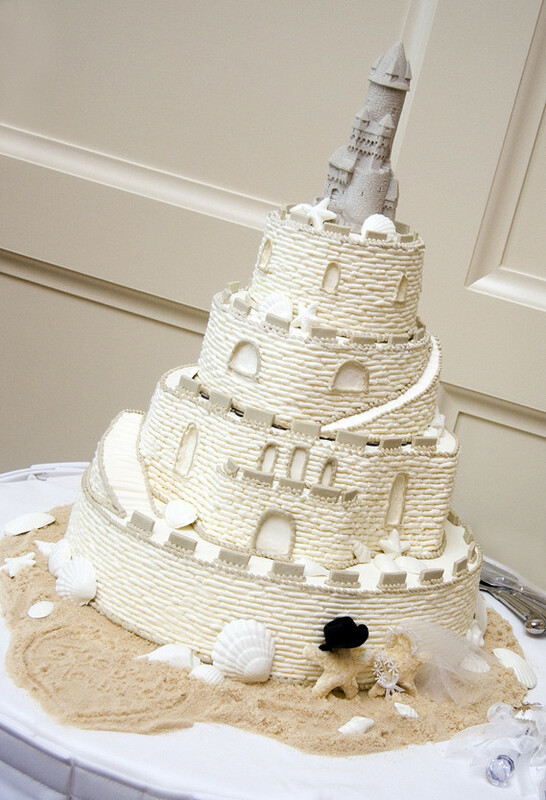 "For those, we can do a beautiful sand castle cake."